SoftPlanet makes it possible for everyone to get free Wise Care 365 download directly from our servers. There is no registration needed for downloading. To take care of your car is as important, as to take care of your computer. Wise Care 365 v3.59 can help you manage that with ease and automate all the daily and sometimes difficult routines. 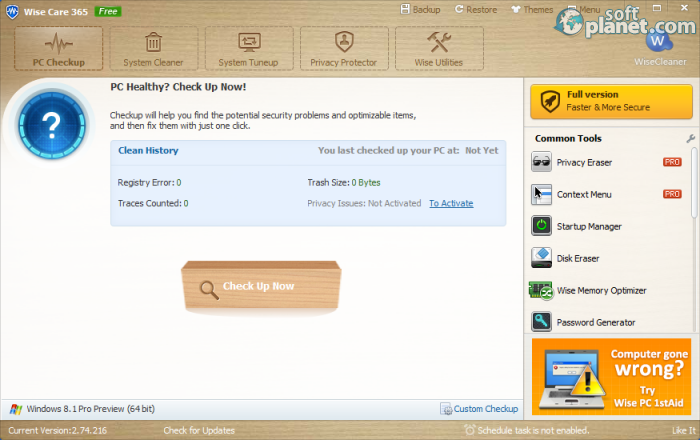 This tool is easy to use, it can find almost all of your problems using the integrated Disk and Registry cleaners. 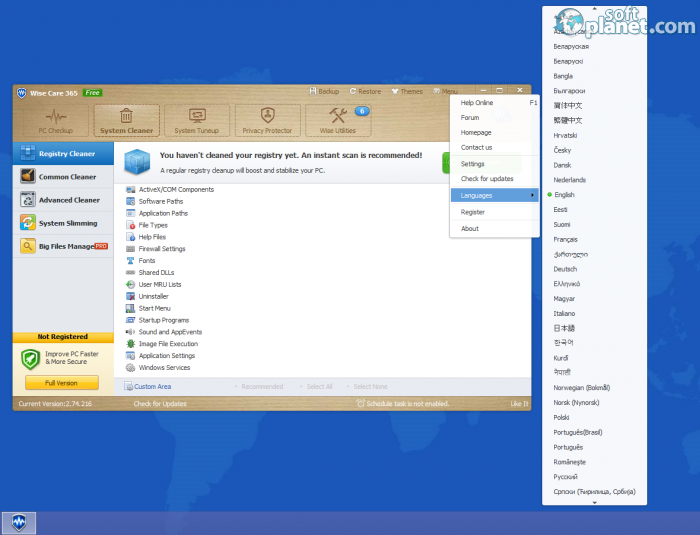 The programs, which start along with your computer OS, can be managed with it. The latest version of Wise Care 365 v3.59 has minor bug fixes and some interface improvements. The language support is unbelievably huge and the fact that it can be installed on any Windows 2000, XP, Vista, 7 or 8, 32-bit or 64-bit version, makes it really versatile. The main features are Disk Cleaner, Registry Cleaner, System Tune-up and Privacy Protector. Six more wise utilities are situated in a separate tab, which only contributes to the better performance of this application. Wise Care 365 comes with five different themes to choose from. To be honest with you, we have to say that for a program in that category, this is not as important, as the result the application returns. Five steps are needed to be taken to go through the welcome tutorial. Then the main program screen shows up with five tabs at the top. Through them all the features are reachable and three of them have sub-tabs with other detailed settings. 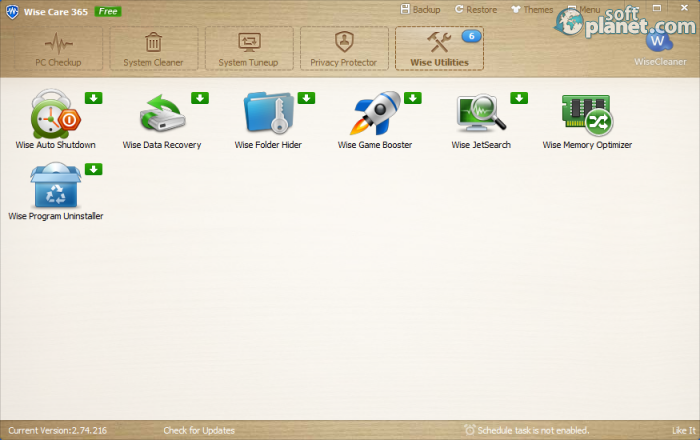 Wise Care 365 can create a system restore point and a full registry backup. This is strongly advisable before you start using the program, just in case. 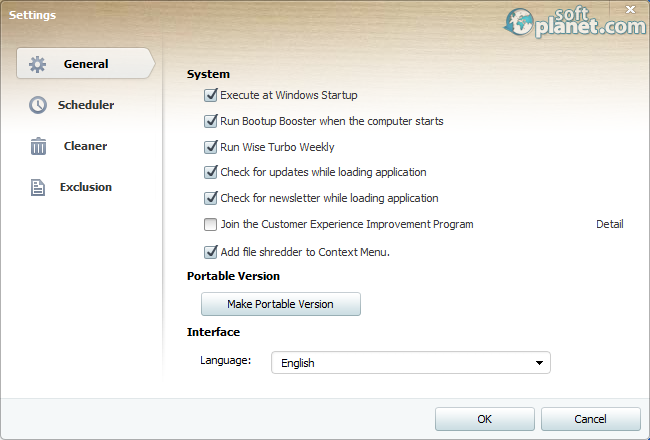 These functions can be reached at the top of the program window, if you click on the Backup link. The Restore link is next to it from which everything can be fixed back to the initial state, if you need. Wise Care 365 3.59 can be used to clean your brand new PC, for example, from all the unwanted software programs which come with it. Some of you probably already know that if you install many programs and then remove them, the computer clogs with useless files. On top of that Internet browsing brings even more. To fight all that, we advise you to use Wise Care 365 and be sure that the health of your PC is in good hands. 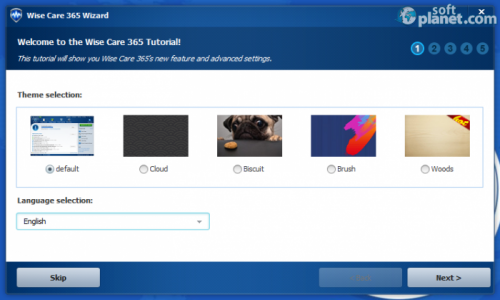 Wise Care 365 is VIRUS-FREE! Our security scan shows that Wise Care 365 is clean from viruses. The current version of Wise Care 365 has been scanned by our system, which contains 46 different anti-virus algorithms. That ensures that Wise Care 365 3.59 is 100% safe for your computer.